New Orleans, Louisiana. 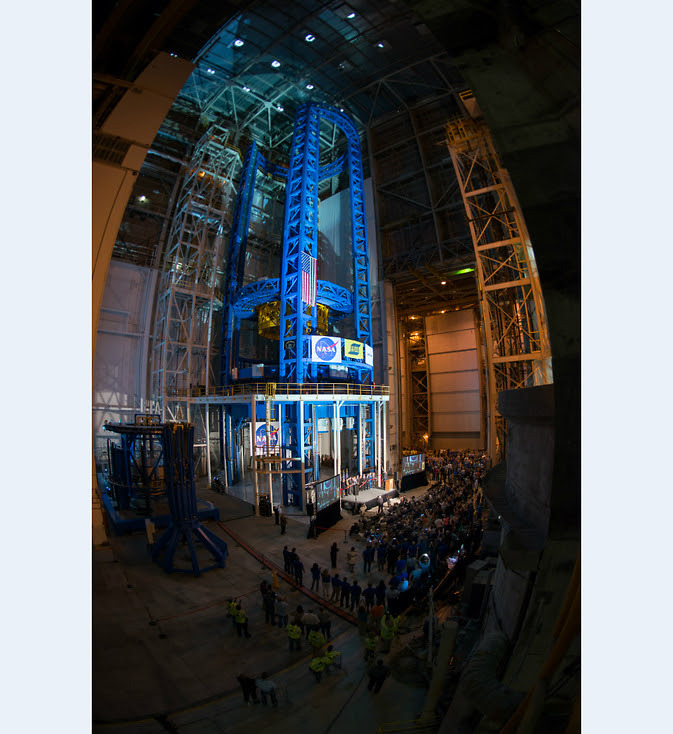 September 12, 2014 – The largest spacecraft welding tool in the world, the Vertical Assembly Center, officially is open for business at NASA’s Michoud Assembly Facility in New Orleans. The 170-foot-tall, 78-foot-wide giant completes a world-class welding toolkit that will be used to build the core stage of America’s next great rocket, the Space Launch System (SLS). SLS will be the most powerful rocket ever built for deep space missions, including to an asteroid and eventually Mars. The core stage, towering more than 200 feet tall (61 meters) with a diameter of 27.6 feet (8.4 meters), will store cryogenic liquid hydrogen and liquid oxygen that will feed the rocket’s four RS-25 engines. “This rocket is a game changer in terms of deep space exploration and will launch NASA astronauts to investigate asteroids and explore the surface of Mars while opening new possibilities for science missions, as well,” said NASA Administrator Charles Bolden during a ribbon-cutting ceremony at Michoud Friday. The Vertical Assembly Center is part of a family of state-of-the-art tools designed to weld the core stage of SLS. It will join domes, rings and barrels to complete the tanks or dry structure assemblies. It also will be used to perform evaluations on the completed welds. Boeing is the prime contractor for the SLS core stage, including avionics. Work is well underway on several additional welding tools. Engineers recently completed welding all the rings for the first flight of SLS using the Segmented Ring Tool. Ten barrels also have been welded for the SLS core stage using the Vertical Weld Center. The rings connect and provide stiffness between domes and barrels, which will make-up the five major core stage structures: the forward skirt, the liquid oxygen tank, the intertank, the liquid hydrogen tank and the engine section. SLS will be the world’s most capable rocket. It will open new frontiers for astronauts traveling aboard NASA’s Orion spacecraft and may also offer benefits for science missions that require its use and cannot be flown on commercial rockets. This week, engineers at NASA’s Kennedy Space Center in Florida completed the crew module for the Orion spacecraft that will venture into space on a test flight in December. In addition, NASA’s Ground Systems Development and Operations Program, which is transforming Kennedy to support the launch of SLS and other users, completed a major agency-level review and was approved for progression from formulation to development.